At a time when the public was horrified by the human rights atrocities of World War II, millions of the world's citizens welcomed the creation of the UN's Human Rights Commission (HRC) in June 1946. As one of only two standing commissions established by the UN Charter, the HRC was designed to serve as the UN's primary body for human rights policy formulation. As such, the commission quickly assigned itself the ambitious task of drafting an International Bill of Human Rights (IBHR) and set to work on the difficult job of writing a document that would be acceptable to all. It is clear that the international community felt confident in the commission's ability to undertake its work, and nations took great care in sending prestigious intellectuals and public servants to act as their representatives. By and large, it was this work, in combination with refugee issues, that dominated the first few years of the commission's agenda. In addition to these initial activities, however, the HRC also made one crucial decision at its first meeting that would profoundly effect it for years to come. 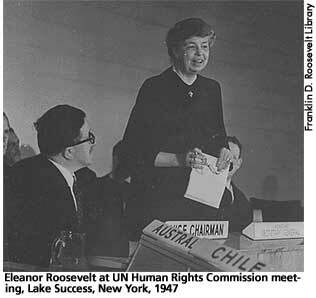 In unanimously selecting Eleanor Roosevelt to serve as their chairman, the HRC members insured that a powerful voice for strong human rights action would steer the commission through the creation of the IBHR and set the standard by which future chairmen would be judged. Drafting the IBHR proved to be a more difficult assignment than anyone had anticipated, and to expedite the process the HRC proceeded first with a declaration that would enumerate each human right individually. It was this document that evolved into the Universal Declaration of Human Rights (UDHR), adopted by the General Assembly on December 10, 1948. Eleanor Roosevelt regarded its creation and passage as her greatest single achievement, and it unquestionably represents the most important contribution the HRC has ever made to the global advancement of human rights. After the declaration's climactic adoption, the HRC returned to work on a human rights covenant that would legally bind member states to enforce the declaration's provisions. This too proved to be an arduous task, replete with the deadlock that had come to characterize the UN as a result of the Cold War. Negotiations over the tiniest minutia proved exceedingly difficult and little progress was made. Furthermore, in 1951 Eleanor Roosevelt relinquished the HRC's chairmanship, though she continued to serve as the official representative of the United States until President Eisenhower replaced her with his own appointee in 1953. Throughout the 1950s and 1960s, the HRC continued to negotiate a Covenant on Civil and Political Rights and a Covenant on Economic, Social, and Cultural Rights, both of which remain functioning instruments to this day. Throughout its history, the HRC has remained the UN's primary tool for articulating human rights policy, and its sessions in Geneva often attract major headlines. This has been especially true in the last few years, most particularly in 2001 when the United States failed to win a seat on the commission for the first time since its founding. Glendon, Mary Ann. A World Made New: Eleanor Roosevelt and the Universal Declaration of Human Rights. New York: Random House, 2001, 17, 30-46, 204-205. Office of the United Nations High Commissioner for Human Rights. Internet on-line. Available From http://www.unhchr.ch/.